the place where all jazz enthusiasts can find useful tools for their practice and study. I started to create virtual jazz drum loops to make my students’ daily practice and mine more efficient and fun. The aim was to go beyond practicing with a metronome to focus on jazz rhythm and groove with the drums! The result was so exciting that I decided to create the first jazz rhythm encyclopedia: Drumgenius! I selected many of the most important jazz beats from early to contemporary styles and elaborated my own samples (using keyboard and XLN Addictive Drum Library), working mainly to simulate the beats and the “time feel” of the most famous drummers of jazz history. Each style, each time feel is like a dance that guides your breath, your gesture and your creativity in a particular way: with Drumgenius you can practice any style, any rhythm with an “expert and reliable” virtual jazz drummer available 24 hours a day!. Of course, no loop will ever substitute for a real drummer, especially in jazz, where the touch, breath, phrasing, action and reaction are extemporaneous, unique and unrepeatable: however, I strived to make every loop of Drumgenius as realistic and swinging as possible! Mauro Battisti, born in Rome (Italy) in 1963, double bass, graduated from G. Rossini Conservatory of Pesaro (Italy). His collaborations and/or recordings include many renowned names of jazz such as Lee Konitz, David Liebman, Cedar Walton, Benny Golson, Barry Harris, Tony Scott, Paolo Fresu, Harold Danko, Houston Person, Dado Moroni, Mark Murphy, Charles Davis, Joe Pass, Al Grey, Joe Newman, Etta Jones, Earl Warren, Steve Grossman, Ronnie Cuber, Joe Diorio, Ernie Watts, Al Cohn, Eddie “Lockjaw” Davis. Other credits include many television, radio, and motion picture sound track performances under the direction, among others, of Academy Award winners Ennio Morricone, Nicola Piovani and Luis Bacalov. As sideman or with his own bands he performed in Europe, United States, Australia, Russia, China, Middle-East and North-Africa. 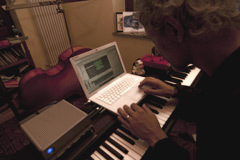 In the past decade, he has focused also on projects that include music compositions for theatre and jazz performances with actors such as Arnoldo Foà , Gabriele Lavia, Pamela Villoresi, Alessandro Haber, with dance companies such as Ater Balletto and with poets such as Pasquale Panella and Gabriela Kurilewicz. He served for five years as artistic director of FORMA – theatre and institute of arts & philosophical research of Varsavia. As a teacher, he conducted for three years a master class on perceptive relationship between sound and image at European Institute of Design of Turin. Since 2010 he is conducting Jazz Bass course at Centro di Formazione Musicale, Civic School of Music of Turin (Italy).